Plan to attend on Thursday, January 28 at the Grand Rapids Public Library. Learn more about the proposed fish farm on the Holy Waters of the Au Sable River in Grayling, Michigan. 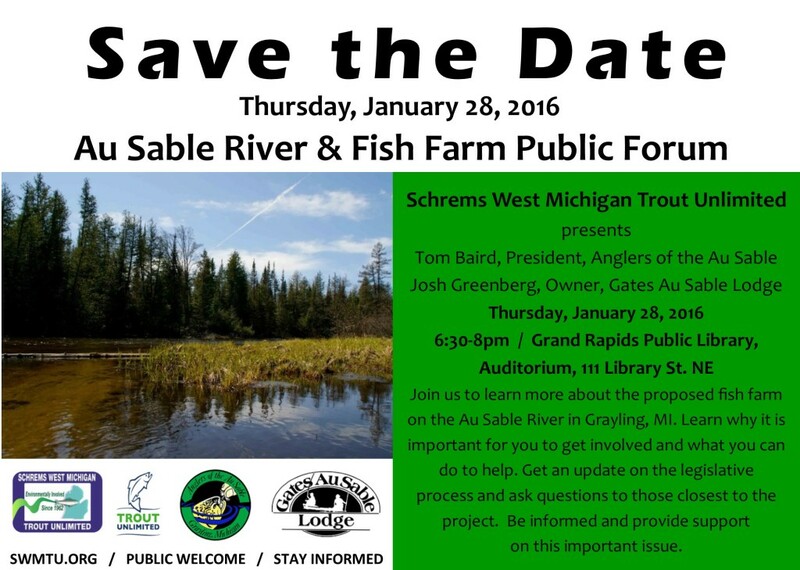 There will be presentations from both Tom Baird, President, Anglers of the Au Sable, Flying Fishing Conservation group, and Josh Greenburg, Owner, Gates Au Sable Lodge. The potential for a fish farm on the Holy Waters is real. If you are conservation minded and care about the quality of the most pristine waters in our state, then you will not want to miss the chance to hear from those most involved. A legislative update will be provided as well as time for Q&A.